Charlevoix is named after Pierre François Xavier de Charlevoix, a French explorer who travelled the Great Lakes and was said to have stayed the night on Fisherman's Island one night during a harsh storm. In the 1880s, Several professors from the University of Chicago formed the Chicago Club Summer Home association. It wasn't long before the city became known as a resort destination. 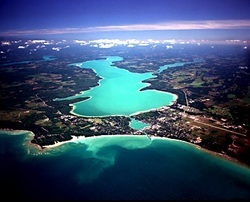 Charlevoix is surrounded by water, making it an ideal summer vacation destination. In addition to Charlevoix's natural attractions, the area boasts excellent shopping, dining, and special events which take place throughout the year in the little northern Michigan community known as "Charlevoix the Beautiful." Venetian-The Venetian festival began in 1931 with a very simple boat show in Charlevoix's Round Lake and has now grown into a week long festival bringing in tens of thousands of people. 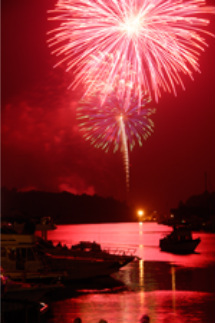 Venetian now includes two nights of some of the best fireworks in Northern Michigan, big name concerts, a parade, athletic events, a carnival, a boat parade, and many more family friendly and adult activities. Apple Fest- The 39th annual Apple festival was celebrated in October 2017. The Apple festival celebrates one of Northern Michigan's most prominent fruits, the apple. It gives local farmers the chance to sell their harvest right in the downtown Charlevoix area. The festival also includes pony rides, face painting, a craft show and many more activities to draw in tourism.